Arayo's Ride: Celebrating our Arrival! The bombs woke me. 5 am - maybe 5:30. A series of explosions rocked the little town of Ajijic Mexico. I knew that the Day of the Dead was gearing up and thought perhaps it had something to do with that so I went back to sleep. After all, we'd had little sleep the night before and a grueling 14 hours of getting lost, getting into Mexico and that long long long drive south. I needed the sleep. But, when another barrage of explosions sounded about 3 hours later it was time to investigate. In the distance I heard music. Time to start pumping coffee and go see what was happening! Every October the Virgen del Rosario makes a journey to the San Andrés Church. She remains there for the month, then on the 31st she is returned to her home at the old stone chapel on the Ajijic plaza. The day is full of celebrations and enormously loud "bombs" are deployed to help send prayers heavenward. Arayo and I walked from our hotel along cobblestone streets to find the the plaza 6 blocks away. Receiving her normal attention, Arayo was still on edge. Periodically the bombs would blow again. As she sat and trembled, I knew it was time to get her back to the hotel and hug her a bit. The procession to return the Virgin to her home came down the street in front of the hotel late in the afternoon. 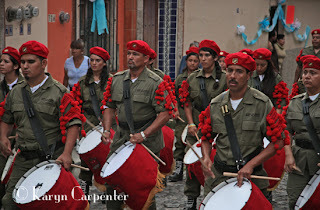 A uniformed drum corp was followed by other Mexican bands, Indian Dancers in stunning ceremonial dress, many floats featuring children dressed as the Virgin, and possibly my favorite float - one with a cross and a half naked man at the base of it - painted to look like he had wounds from being on the cross. He lay in a woman's lap. It was all very life-like - until he cracked a smile. I think he'd been laying there half naked for too long. "Jesus" was life-like.... until he cracked a smile! Finally, the Virgin came, followed by masses of people who had made the walk to retrieve her and return her to her home. Some carried babies or small children, at least one old women did the walk in bare feet (and these are NOT comfortable to walk on, even in very sturdy shoes!). I saw one woman doing the walk blindfolded - led by two other women. At night, a celebration was held in the plaza with live music and fireworks. Told the fireworks would happen at midnight, Arayo and I walked down, only to find we were the only Americans there and we'd missed the big event. Ah, well - it was fun to see the Mexican families and couples of all ages, dancing, playing and enjoying life in the perfect midnight air. 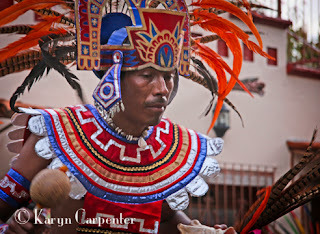 As we walked through the darkened street back to our hotel, we were thrilled to have come at this time of year and to experience these special Mexican traditions. Great pictures! So wonderful you got there in time for these celebrations! Great pictures! Wonderful that you got there in time for these celebrations! I want to thank you for illustrating your blog post with the photo of the half naked man rather than the virgin. And, WOW! The costumes for a small celebration are something else. I just read the Wikipedia article on Mexican Holidays and find that there are 34 total, in 3 different categories. And that doesn't even count the local holidays like your Half-Naked Man day. Karyn, I'm loving that you're loving it! Isn't the Mexican culture fascinating!